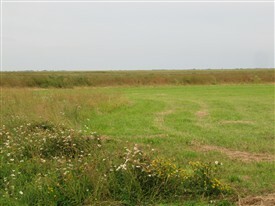 In the 1940s there were four inhabited farms on Wallasea Island: Grass Farm, Lower Barn, Old Pools and Tyle Barn. The island was reached by a causeway crossed by a narrow cart track. There was no electricity or gas on the island and no proper roads, just muddy tracks. Before the war 500 acres of the island had been used for growing corn. Now, in 1943, 1000 acres were under the plough. Earlier in the war there were 13 labourers but by this time there were just four. The workload was huge and with an additional demand for six corn stacks to be threshed as part payment to a former farm owner for the purchase of Grass Farm, the future son in law of the new owner took matters into his own hands. Thomas Miller was employed as farm manager and was in Rochford with his fiance on the night the stacks caught fire. His alibi seemed watertight but he was caught by detailed and patient detective work and, when tried at Essex Assizes, was sentenced to four years penal servitude. The fire broke out early in the evening of 20 January, 1943, and was noticed by a farm labourer some distance away. By the time he and his wife arrived on the scene four stacks out of the six were burning vigorously. There was no water to attempt to put out the fires. The fire brigade could not get their engines across the causeway track and there was nothing to be done but to stand and watch the destruction of a large quantity of valuable food. Other neighbours had been roused to help and Mr Hawkes, who lived in the neighbouring Tyle Barn, was walking helplessly behind the unburnt stacks when he noticed a faint flickering light on one of them. He found that a small space had been made at the base of the corn stack in which was burning a candle held in a strange device. The candle holder was made from a piece of bamboo surrounded by a cardboard windshield secured with a nail and wire. A thin piece of rope soaked in kerosene had been carefully threaded through a hole drilled parallel to the wick. Mr Hawkes noticed a similar device in the other unburnt stack. He took both home and said nothing until the next day when the police started their investigations. This was clearly an act of arson. 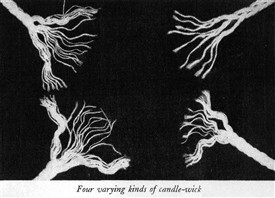 The police collected every other candle on the island, over 100 in all, and found a candle stub at Grass Farm which was the only one identical to one of those found in the unburnt stacks. Forensic examination of the wicks proved this to be the case. 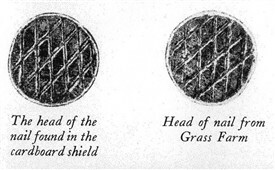 The nails were identical to those found in a workshop at Grass farm. 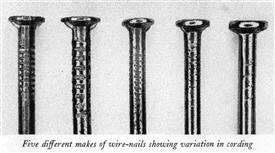 The manufacturing marks on nails are unique to each factory and the markings on them corresponded to those in the candle contraptions. A piece of rope, an oily gimlet and an oil can were found in the same place. Mrs Hawkes had lent Thomas Miller a saw the day before the fire and this was shown to have scraps of bamboo sawdust on it. Four months of detective and scientific investigation had led to the conclusion that Miller was responsible for making the candle device to set fire to the corn stacks when he was off the island. 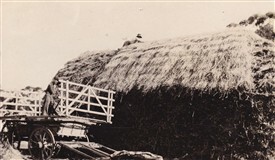 The motive appeared to be that there was already too much ordinary work for the reduced labour force to cover without the additional work involved in manually threshing six stacks of corn for a former owner. The jury found Thomas Miller guilty and the judge, when passing sentence, commented on his selfishness in planning a crime which would throw suspicion on farm servants and led to the loss of £1300 worth of badly needed foodstuff in a time of war.